These guys are Kyushu bound! That is right, Rob’s team are heading to Mainland Japan seated #1 in the tournament. Team Enagic defeated the number one team in Okinawa (Okiden) to take the number one spot in the tournament. Can you believe it, the beat the number one team Okiden! Those guys have held this spot for year, but not Enagic is #1, I am blown away! In fact, Okiden has not missed this tournament in Kyushu in like “forever”, but they were completely eliminated. God Enagic #1! We invited the Orpilla’s for dinner at Tom’s Dads house. So we had a BBQ with the whole family. Afterwards we sat down and watched the Laker’s game. NIel had a good time talking with Tom’s Dad, they are both in the printer business, so they had a lot to say, it was a blessed time. 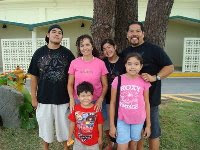 Please pray for the Orpilla’s as they seek the Lord’s direction for their life. Hannah took her test to receive her driver’s permit and “She Passed!”. This is great news, now she can start the behind the wheel training. Watch out everyone! First it was Kayo, now it is Hannah! Wowwy Kazouwiiii! Joel received a call from Immigration the other day, they gave him a 3 year visa! Praise God! That is such a blessing! God has great things in store for our brother, and we continue to look forward to all the good work that He is doing. God bless you Joel and congratulations! As we are in the States right now, we have a good group of students and interns hanging at the Koinonia Cafe. Amanda’s sister is with us, as well as Joel’s buddy, and the guys from Macau. Even though we are not there, Joel is showing them a good time. God is good, and has great things in store for this group. Tokito had a good time hanging out with the Amargo clan Friday and Saturday in Temecula. The visited Sand Diego on Saturday and ministered at CCLosAlamitos on Sunday. It is always a blessing to hang out with the Amargo’s. Zach and the Amargo’s (sounds like a good band name) led worship at Pastor Greenroyd’s church this Sunday morning. They did an excellent job and everyone was blessed. It was a good morning service. It’s Party Time for the Graduates! Here are some more pictures, most of them are of the party at Pastor Cisco’s house. The Amargo’s were late getting there so Toki and the A team are not in the picts. But if they have some, please send us a link. Or if anyone else has some, please send us a link in the comment box below. God bless you all! The gang arrived safely into LAX, the flight went smooth, fast, but for Joanna it “was a litte long”. When we arrived at Grampa Ruiz House, Asa found some of his old toys. Maybe he picked up the sword because he knows that he is not in Okinawan now and in LA county you will have to defend yourself. Don’t worry Asa, God will take care of us. We flew China Airlines from Okinawa and they give you a small meal from Oki to Taipei. I was blown away when our meal came with the MOS Burger logo on it. Could it be “a burger”? Well, yes it was! It was a rice burger filled with a type of Korean beef! As many of you know, who live in Okinawa, MOS Burger can get a little pricy, this was a good surprise meal. Tuesday evening the Ruiz’ and Tokito headed out to California. Zach and Toki will be graduating from CCBC Murrieta on Thursday. Please pray for us that we have a fruitful time in the States. Toki will be heading out to Nevada to join up with Eder next week. God bless you Justin and Anna, we are going to miss you both. May the Lord lead, guide and direct your steps. We had such a blessed semester and it was so fun. Thank you Anna and Justin for making it a great semester. Today Jillian is heading back home to Texas, we are going to miss that girl. Thank you Pastor Mike for sending your daughter to us this semester, she was such a blessing. Time flew by so fast! Take care of yourself sis, we are going to miss you! At the same time, Eder flew out of Okinawa today, but he is heading to Mainland Japan to hang out with Rusty and Amber for a few days. He will be following Rusty in his footsteps of ministry there. He is going to have a blast hanging out with Pastor Travis and Snider boy. God bless you Eder, be blessed! Sunday May the 17th there was a protest against the Futenma Marine Base. For those of you who have not had the chance to follow the news the Okinawan People want the Futenma Base moved off of Okinawa. It seems like it is gaining strength. The base is huge 6 miles around, and the Okinawan’s joined hands against it. Because we are located right on the 330, people were joining hands right in front of the cafe. When you think about it, it was an incredible work of communication. Back in September 2009, they covered the story of Cha Sa-soon, a 69-year-old South Korean woman who, over a period of four years, spent over 4,000,000 won ($3,500) on driving tests—all of which she failed miserably. It appears that all her hard work paid off, as Miss Sa-soon has finally earned her license! It took Cha Sa-soon over 960 tries, but she is now an official member of South Korea’s driving club. According to the Huffington Post, Miss Sa-soon passed the written portion of the exam on November 4, 2009 with a minimum passing score of 60 out of 100. After that came the driving test. Wow! And we thought Rob had a difficult time, good thing Mike Snider passed too! Just some interesting news. Before the girls start to leave island; they got together in Nakagusuku at a hotel up the hill. The hotel offers a deal on the “all you can eat” buffet plus an onsen (Japanese bath house). The girls had a great dinner and then they relaxed in the JBH. I don’t know if this picture was taken after the onsen but Anna looks pretty relaxed, that picture looks familiar, like the one that I took of her in Genesis class. It is starting to happen. John Michael and Cory (the Floridian’s) are heading back home. It was a blessing having our brother’s with us for this past semester. God bless you Cory, we love you bro, stay focused on Jesus! John Michael, be blessed as you head home to help in work with your dad, make sure that you are led by the Spirit in your decisions for next semester. God bless you brothers, Pastor Tommy. It is amazing to see how time can change things. September 2008 Eder first came to us from Nevada, and now he has lost some serious weight. The healthy Okinawan food has done wonders for our brother. He arrived in Okinawa at 275 pounds, and now he is 208, that is almost 70 pounds (35 kilos) lost! Here at the Bible College the students eat healthier. We make sure to provide for them a good diet low in fat, but high in Okinawan vitamins and minerals (we eat a lot of the local produce). But again Eder is committed to working out 3 times a week getting up at 5:30am (doing his devotions) and being at the Gym by 6:30am in the morning. Breakfast at the Cafe is at 8am. Great job Eder, you are looking good bro! This group photo tells it all! We had a great semester this year with the Bible College Students. Thank you all for being faithful to come out to Okinawa and make this semester the best so far. Everyone stepped up to the plate, learning Japanese, speaking English and translating into Japanese and English. Praise God, thank you Jesus! Pastor Rick and the guys from CCOkinawa blessed all the students by taking them out to lunch Thursday afternoon. We went to Pizza Inn, an “all you can eat” pizza joint near Kadena City. We rocked it, all of us did, we chowed down! I like Japanese pizza, they have some strange combinations like; squid and corn, taco rice pizza, mayonnaise, but then they have the standard, Hawaiian, pepperoni, you name it, and most of it is thin crust, ahhhhhh we love it. Today Eder was approved for his missionary visa to continue on in ministry here in Okinawa. We are so blessed with his approval. We were hoping for a 3 year visa, but instead he was given a 1 year. God bless you Eder, Praise the Lord for this approval! I cannot believe it! In the 6 years that I have lived in Okinawa there is no way that I would have ever dreamed of putting on my heater in the car in the middle of May. It was so cold and rainy today that we had to put the heater on to get rid of foggy windshield in the car. Forget about global warming, we should be in full swing of the beaches here on island, instead, it is time to bring out the blankets. Wednesday night we celebrated the graduation for Cory, Tokito and Zach. Tokito is our first Okinawan 4 semester graduate. God has great things in store for these men, and we look forward to being a part of that great work. God bless you men and congratulations on your good work! There is a small group in Okinawa who are demonstrating against the bases in Okinawa. Again it is a small group that gathers in front of Camp Futenma. The other day there was a big demonstration in Yomitan, but as a whole it is not very big. Most Okinawan’s want less bases here but as a whole it is not like CNN or how other stations are broadcasting it. It is a touchy subject here in Okinawa, but I do think that everything will work out. Some of the students and interns at the Bible College put together this video for the upcoming semester. We hope you like it, please continue to pray for the Bible College and what the Lord has in store for us in the future. This last semester was so great because this was the first semester where we had Japanese and English students. So the Japanese as well as the English Bible College is up and running, full steam ahead! Please click on the video above. We had an excellent time at the CCBC Semester Banquet. This year we held it at the Officer’s Club on Kadena Airforce Base. Thank you Chuck Robb for signing the students on and getting all the paperwork ready to do so. The luncheon was delicious! Just like the students like it “All you can Eat”. Like always we give out awards and thank the students for being here, if it was not for them, there would be no College Semester. Also, this semester was so special because we had full time Japanese and English Students together. Thank you all of you who work so hard at translating. But most important we thank Jesus Christ for all His love, support, guidance and discipline, thank you Jesus! Saturday evening we celebrated Michal’s 14th Birthday at the Cafe. She did not want a cake, so Joanna baked her a big cake. The students all went to Justco for some fun and then came back to the cafe for the celebration. God bless you Michal, and Happy Birthday! While Pastor Tom and Zach were in Tokyo John Michael covered for Wednesday night. He did a great job. John Michael is a second semester Bible College Student who has learned a lot in his “Inductive Bible Studies Class.” He will be returning back to Florida at the end of this semester. We are going to miss you bro, God is doing a great work in your life. The students had an awesome luncheon served by Satsukosan Tuesday afternoon. They had katsudon and from what I heard it was delicious! The students have been so blessed this semester with different people coming in and cooking outstanding dished. Praise the Lord! As many of you know Tokito and Zach will be heading to California for their Graduation at Murrieta. Well, after the graduation there will be at party at the home of the Espinosa’s. It should be a fun time. It will be good seeing Sosimo and the rest of the gang. Can you believe it, it feels like they just began Bible College a short time ago. And now they are full on graduates. God has great things in store for them and well look forward for His work in their lives. We have here the first picture of the Spearman baby. They went to get an ultrasound the other day and Rusty said “When I heard the baby’s heartbeat I freaked out”. I told Rusty I knew what he meant. I remember those days, when you hear the heartbeat everything takes on a new meaning. Praise the Lord Spearman’s, we are so blessed for you.